An experience combining text, visual images and music, which referenced the structure of Evensong yet integrated interviews with Peterborough residents about a trip to the moon along with images of their houses, combined with a heavy dose of community involvement. Even You Song sounds like the sort of immersive experience which you might get in an art gallery, and in fact it arose our of the residency of artist Bettina Furnée and writer Lucy Sheerman at Metal Peterborough (Metal Peterborough is a community cultural hub housed in a gatehouse at the entrance to Peterborough Cathedral). Even You Song proved substantial and striking; partly because the community involved was that of Peterborough Cathedral so that the immersive experience took place within the cathedral, and the music performed by the cathedral choir along with a choir of school children was a substantial score by Cheryl Frances Hoad. Even You Song was performed at Peterborough Cathedral on Thursday 16 February 2017, where a huge audience filled the nave and the chancel, whilst the choir of Peterborough Cathedral, children from St Augustine's CE (V) Junior School, Bishop Creighton Academy, West Town primary Avademy and William Law CE Primary School, organist David Humphreys, James Bowstead (conductor of the children's choir), and conductor Steven Grahl (director of music at Peterborough Cathedral), plus Reverend Canon Bruce Ruddock (cantor), Reverend Canon Jonathan Baker (welcome and reflections) and Sue Baker & Keely Mills (readings), performed something which was structured like Evensong, yet had a new text by Lucy Sheerman, and music by Cheryl Frances Hoad. Sheerman's text was based on interviews done with Peterborough couples about going to the moon; this might sound gimmicky, but it was a neutral way of getting people to talk about the unknown and the resulting text was surprisingly thoughtful and poetic. During the performance, images were projected created by artists Bettina Furnée, who had taken pictures in the interviewees homes. Sometimes these were illustrative of the text being sung or spoken and sometimes they were profoundly abstract details. that blended taxing yet learnable music for the cathedral choir, with simpler and imaginative writing for the children's choir, plus two big organ works. Part of the reason for the event was a celebration of the fact that the organ has been re-pitched from 'Old Philharmonic' pitch to modern concert pitch. 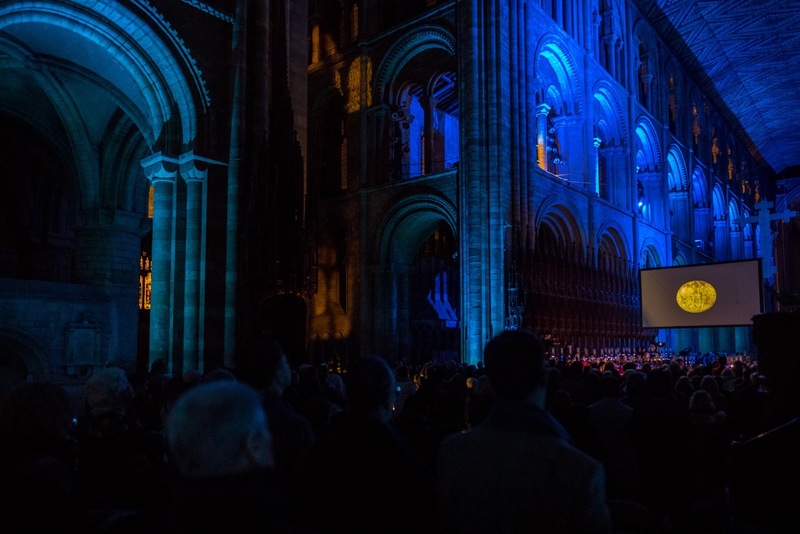 The event took place in a cathedral shrouded in darkness, with just the lights on the stands around the singers (plus of course the light from people's phones as they attempted to read their librettos). The voices of the two priests and the two readers came out of nowhere, and the whole was rather evocative. At the end, starting during the hymn, the cathedral was filled with clouds of incense. Hoad's music started with the opening organ voluntary, Where Does Your Faith Lie? which started from a rumbling low bass in the organ, and rose atmospherically yet thoughtfully. Hoad's Preces and Responses were lyric yet with a certain spikiness (and of course a cantor's part suitable to be sung/intoned by the Canon Precentor of the cathedral, Reverend Canon Bruce Ruddock). The Psalmody, which set a rather beautifully poetic text by Sheerman, combined and expressively free unison line of organ accompaniment with solo moments, to create music which was a spikier kin to traditional psalmody. The Magnificat and Nunc Dmittis used the traditional words, and they are perhaps the pieces most likely to have further life (the cathedral choir first performed them at Evensong last year). The Magnificat was unaccompanied, and had unison lines developing into complex textures, a striking mix of magical harmonies and unisons, to create something lyrical, thoughtful and rather effective. The Nunc Dimittis started from a low drone with a slowly rising line over developing opaque harmony, and then at 'To be a light' the organ comes in with its drone and the choir line rises strikingly. The collects set a charming text which examined what people would take with them on their journey to the moon, a meditation on the things dearest to us. Sung as a unison chant-like melody over organ, Hoad's music gradually gathered in momentum, adding decorative moments in the organ and providing charming moments for the children's choir 'I would take the cat with us. Miaow! Miaow! all the way to the Moon!'. The Anthem combined all the forces is a most effective way. The text meditated on silence, absence, and Hoad made great use of non-verbal noises. Hissing, whistling etc, and built these into a remarkable texture with music from choir and organ. The section considering te hubbub and distraction of the world was particularly notable, with the children's choir providing a hubbub over which cathedral choir and organ created a striking mix of harmonies. The Reflection from Reverend Canon Jonathan Baker, the Canon Missioner, was thoughtful and relevant to the questions raised by the piece, without ever seeming gimmicky or contrived. He succeeded in linking the different concerns of the event into a thoughtful whole which made sense of the fact that we were in a cathedral. There was a final hymn, complete with a complex descant for the trebles at the end, and then the dramatic and vivid concluding voluntary Taking Your Leave. The piece was a complex logistical whole, and seemed to progress without any untoward incident. The individual performances were superb, from the lusty enthusiasm of the children's choir (under organ scholar James Bowstead's direction) to the fearlessness of the cathedral choir under director of music Steven Grahl's direction. The amount of music which the cathedral choir had to learn was substantial, and Hoad gave them some challenging things to do and all rose brilliantly to the task. Assistant director of music David Humphreys made the organ resound superbly. Elements of Cheryl Frances Hoad's score will inevitably take on a life of their own, and the whole event was being recorded. That it was a single performance only made the event so much more striking and remarkable, but it is to be hoped that other churches and cathedrals might be persuaded to take on the whole. Even You Song is sui generis, and a description hardly does it justice. I went along in the spirit of sceptical interest, heartened by the possibility of hearing some of Cheryl Frances Hoad's music, yet I came away moved and convinced. All at Peterborough Cathedral music be congratulated on having the vision to take part in the event.